The local watering hole near the office is now the team’s favorite bar in the world. We learned a few things about this Caribbean beach themed blues bar last night. 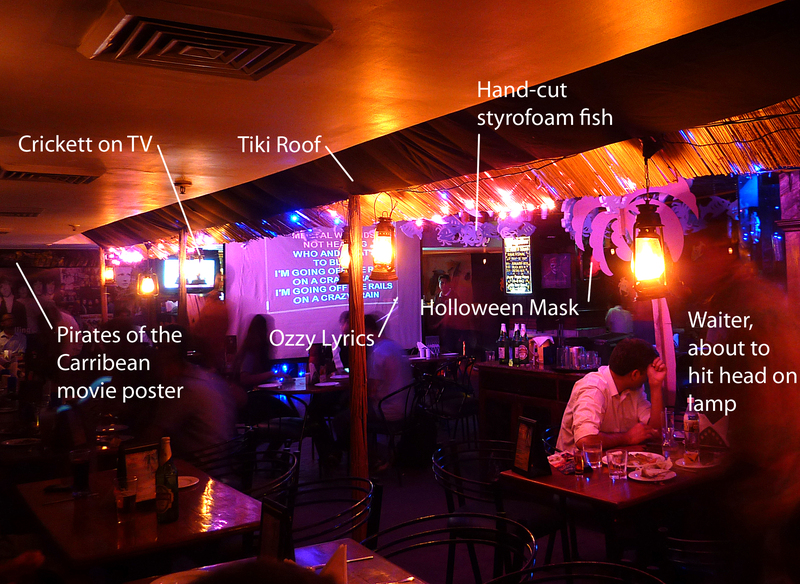 Decor consists of cut-out Styrofoam fish, tiki awnings and Halloween decorations. The reggae imagery adorned menu features Indian, Mexican and Italian food and includes one dish named “the chef’s sister’s recommendation combo.” King Fishers all around! Fortunately, we arrived on Karaoke night. There was a table Indian business men singing their hearts out to a mixture of Ozzy Osbourne, Iron Maiden, System of a Down and, of course, Coldplay. The regulars, who may or may not be part of a hair band, know how to put on a good show too. Now we can all cross “Eat Italian in a Caribbean themed blues bar while listening to Indian business men singing heavy metal” off the bucket list. This entry was posted in Places, Travel and tagged Delhi, India. Now the question is…did you participate in the Karaoke and if so, what did you sing?????? I love this post…so witty and so funny…..more like hysterical! I just read it alound to everyone in the Micro Lab. Glad you took a picture no one would believe the story otherwise. Hope all of the guys are free of strange stomach symptoms.